"They've got their own way of taking out terrorists. Hit them hard. Hit them fast. Hit them after dark!" Ladies and Gentlemen, we've discovered a new classic for the ages. 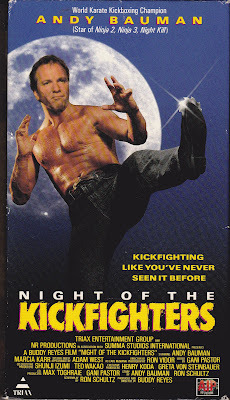 Reaching new, heretofore-unthinkable heights of pure, unadulterated silliness, Night of the Kickfighters is a must-see! Andy Bauman, in his only role to date (disregard the outright lies on the box art, claiming he is in the fake movies "Ninja 2", "Ninja 3" and "Night Kill", also Bauman's face is put on some other meathead's body, for reasons unknown) portrays Bret Crady, a bargain-basement James Bond who spends most of his time doing Tai-Chi in his underwear on a bearskin rug. The "action" starts in "Musquat, Oman" and then quickly moves to "Scottsdale, Arizona". Note the quotes, as seen in the film. Are they not really there? In "Scottsdale", in a big office tower, which is in no way a miniature, businessman, entrepreneur and laser fanatic Carl McMann (West) is showing off his awesome new laser, called the HC 2000, not to be confused with TC 2000 (1993), to some investors. This laser, which the plot revolves around, makes the classic laser noise "pew pew". See: Neon City (1991). This laser is the best invention ever invented and it can make rocks and toy tanks disappear, but has no effect on Adam West. Naturally, bad guys the world over want this "secret weapon", so they kidnap McCann's daughter, claiming "your daughter will be dust". Naturally, McCann turns to Bret Crady to rectify the situation. Crady assembles a team with their own special skills. Clea is good with computers, Sock is the black guy, Bomber (Kowalski) is the "heavy metal" inventor dude with long hair and cool hat, Aldo is a magician and speaks with a theatrical baritone not unlike Sideshow Mel from The Simpsons, and an Asian man who is a law enforcement officer of some kind. No criminal syndicate could withstand this amazing team. Not even if they have overgrown bald man Ponti (Struycken). Will Andy and his team use his Bauman-Fu to save the world? 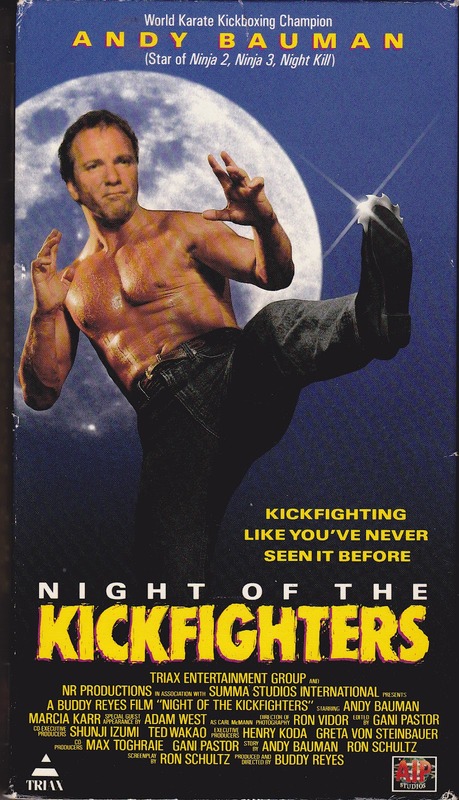 Night of the Kickfighters (even the title makes no sense, why one night? What Kickfighters? 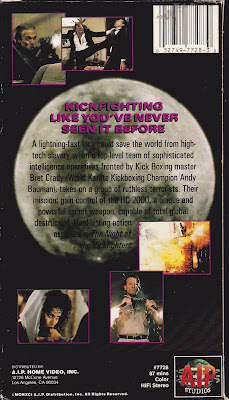 Another tagline claims "Kickfighting like you've never seen it before!" Why do they think I've seen it before? What Kickfighting? WHAT'S GOING ON??!!??! ), is like the movie equivalent of a clumsily fumbled football. It is chock full of stilted non-acting and non-action. Bauman makes Ron Marchini look like Sir John Gielgud. Imagine Marchini's immortal "Can I help you guys?" line from Karate Cop (1991), but that flat, unaffected delivery is EVERY LINE. Most of the cast just looks utterly confused. And who can blame them, with all the crazy voices and ADR, silly miniatures, stock footage, plot insanity, stock PICTURES, jagged editing, etc., etc. To say this film is nonsensical is an injustice to the word. 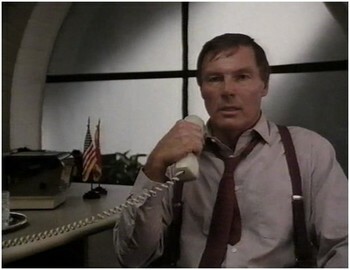 Adam West, head of "McMann enterprises", puts in a strange performance. We suspect he was paid by the word, as in some scenes he just stands there limply. Any scene where he is on the phone is clearly not him talking. The scene at the "Fantasy Club" is so dumb, we're, well...dumbstruck. 75% of the movie takes place in an underground parking garage. Someone turns on a hose and in the next cut they are neck-deep in water. One of the many guards engages in combat with an inflatable dinosaur. Out of all the things special-ops soldiers can bring to a mission, clearly this is the handiest. Characters come back after they are supposedly dead, and characters are still talking on the phone after they both have hung up. Laser effects need to be seen to be believed. Bauman trains by lying on a bed of nails and has people smash cinderblocks on his chest. Bauman's use of nunchuks recalls Clash of the Ninjas (1986). We could go on and on and on, but you need to see this yourself. Trust us, we've barely scratched the surface. We've given away nothing. Ending on a weirdly and inappropriately sad note, Night of the Kickfighters piles total insanity on top of total incompetence, for a cocktail of sheer amazement. The four stars are for the unabashed entertainment value, and isn't that what movies are all about? BUY IT TODAY! You won't be disappointed. When you guys give the site a make-over,add a "request a review" section. I request "Kill or be killed" and "Kill and kill again". Thanks! You were great in this. Have any on-set stories from the production? Haha! It's totally worth it. It's absolutely ridiculous. Thanks for the info - it is much appreciated! Too bad a making-of doc doesn't exist we would love to see it too. No DVD available unfortunately. But it's on VHS.